Quebec’s governing party introduced legislation Thursday that would ban public employees from wearing “overt and conspicuous” religious garb, such as headscarves, yarmulkes, large crosses and turbans. The so-called “Charter of Values” also would require all Canadians living in the province of Quebec to have their faces uncovered when they receive state-funded services, including health care and education. Several other countries have considered restrictions on religious attire, including France, which has banned full veils in public places and headscarves in schools. The Quebec proposal already has sparked protests and political opposition. Much of the public debate over the charter has focused on the measure’s potential impact on immigrants and their religious beliefs and practices. Why is this happening in Quebec? News accounts suggest that political motivations, Quebec’s traditional identity, women’s rights and a possible backlash against Muslim immigrants all are factors in the debate. Proponents of the restrictions on religious attire say they are necessary to preserve “the values of secularism and the religious neutrality of the state.” Opponents say they would infringe the freedom of religious minorities and immigrants, particularly Muslims. The demographic trends underlying the debate are complex. The percentage of Muslims in Quebec’s population (3.1%) is about the same as the rest of Canada’s (3.2%), according to Statistics Canada’s National Household Survey. And Quebec actually has a smaller percentage of foreign-born residents than the rest of Canada does (13% in Quebec, 23% in the rest of Canada). But the religious makeup of Quebec’s immigrants is somewhat different from the religious profile of immigrants across Canada. 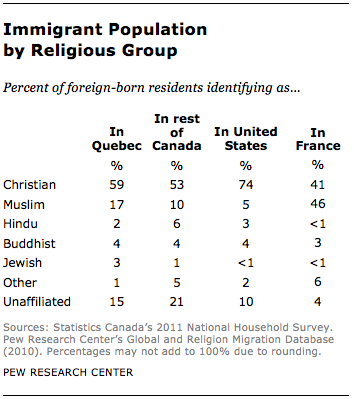 A larger share of immigrants in Quebec are Christian (59% vs. 53% in the rest of Canada). But more of Quebec’s immigrants also are Muslim (17% vs. 10% in the rest of Canada). By comparison, in the United States, Pew Research Center data show that Christians make up a much larger share of immigrants (74%) than in either Quebec or in Canada as a whole, and Muslims make up a much smaller share (5%) of foreign-born U.S. residents. In France, by contrast, Muslims comprise more of the foreign-born population (46%) than Christians do (41%). The proposed restrictions on religious attire in Quebec appear to face an uphill battle in the province’s legislative assembly. They are backed by the Parti Quebecois, which is Quebec’s governing party but has only a minority of seats in the legislature. Other political parties that comprise the majority of legislators do not back the measure as drafted. If the measure passes, according to news reports, it is likely to face a court challenge.